I don’t like canned cranberry sauce. Which is why, when presented with my most reviled type – jellied – I do my best to make a mockery of it (see above, Mom doesn’t like my mockery). But as Thanksgiving grows near, I feel I should at least make a mention of the stuff. Native Americans apparently liked cranberries fresh or dried, which is how they eventually came to be eaten with the Pilgrims that first feasting year. Though somehow I doubt they were served from a can and sliced into little round discs. I do like cranberry relish, or cranberry orange relish. And you can make your own cranberry sauce quite easily with a package of cranberries, sugar, and some orange juice. Ok, there is something fantastically nostalgic about good old Ocean Spray. So you know what? Go ahead, cut me off a slice. Thanks for the flattering photo. 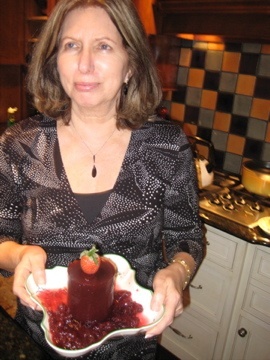 Grrrr….you are making the cranberry relish this year!!! Why is it that in Kate’s blog we see Mom holding a “slug” of cranberries, but Dad drinking fine wine & slurping great food @ various top restaurants in Napa Valley!! !